I’ve been playing around with the Nintendo Switch for the last couple of days and I thought I’d give a few impressions on the console’s hardware. First things first, you might have heard early reviews of the hardware claiming it to be too big and power inefficient to be a good portable gaming system, and too underpowered to compete in the home console market with the Xbox One and PlayStation 4. To be sure, there’s a degree of truth to that opinion. However, there’s real practicality to being able to play at home and on the go that gives the system a value that its more powerful competition just doesn’t have. I’ve been pleasantly surprised by how big Zelda is as a game, and how good it looks, even when upscaled to my TV in docked mode. I’ve also been pleasantly surprised when taking the system on the go. In fact, after a few hours of playing Zelda on my TV, it was something of a mind blowing moment to then take the system with me so I could play the full game, where I had left off, away from home. Ever since the Wii (though you could argue, ever since the Gamecube) Nintendo hasn’t been interested in playing the specs game. They’re far more interested in delivering innovative features that their competitors aren’t. Whether it’s motion controls or bridging the gap between home console and mobile gaming, Nintendo continues to focus their attention on doing something different. By all accounts, hardware deficiencies aside, the Switch successfully fulfills the promise of a two-in-one gaming system in ways the Wii U didn’t. While Zelda’s stylized graphics look pretty great both running at 720p in portable mode and while upscaled to 900p while in docked mode, the upscaling seems to produce frequent frame rate dips. It usually runs at a smooth 30 frames per second (fps), but depending on the area of the map you’re exploring, the number of enemies on screen, and the amount of elemental effects happening at a given time, you’re likely to see a noticeable dip to around 20fps. I even had one time when the fps dropped so low that I was afraid the game was going to crash. However, after a moment things went back to normal without crashing. While these extreme examples of slow downs and frame rate dips are very few and far between, the more minor drops to around 20fps are quite common. It’s not game breaking by any means, but it is noticeable. For what it’s worth, these performance issues go away when playing in portable mode. These issues might just be exclusive to Zelda, but considering this is the game used to launch the system, the performance issues could be cause for concern moving forward. The joycons are surprisingly comfortable to use. I was afraid they’d be too small, so I bought a pro controller intending to use that for the most part. But after trying out the joycons in two of the three possible configurations (I used them while attached to the screen, and while in the joycon grip, but have yet to use them separated with one in each hand) I can honestly say they don’t feel that far off from a full sized controller. That’s thanks in part to the size of the tablet with its 6 inch screen. So critics can call it too big to be a portable, but the device packs comfortably into a backpack or messenger bag and allows for buttons and thumbsticks that feel far more comfortable than the all too small joysticks of other handheld gaming devices (I’m looking at you PlayStation portable systems). Furthermore, the soft touch plastic on them feels nice in the hand. It’s a nice touch that adds a bit more of a premium feel to a controller made largely of plastic. All the buttons are nice and clicky, none of them feel mushy, and they all stick out enough that you won’t have trouble finding them without looking. And things only get better when you pick up the pro controller. If you’re accustomed to the PS4’s Dualshock 4 or the Xbox One’s controller, you’ll probably want to pick up a pro controller if you’re planning on doing any lengthy gaming sessions in docked mode. Just be aware that it’s not cheap. The pro controller will run you $70 (that’s $10 more than a PS4 Dualshock 4). As a side note: I also had a tough time initially remapping my brain in order to recognize the location of the A,B,X, and Y buttons. They’re essentially in reverse order from where they’d be on an Xbox controller, which means any time the onscreen prompt asked me to hit the A button, I instinctively hit the B button on accident. Both the PlayStation and Xbox controller layout tends to favor the button at the bottom of the diamond layout (X for PlayStation, A for Xbox) for many of it’s basic controls, with the far right button (O for PlayStation, B for Xbox) being the back button. Those being reversed on the Switch caused more problems than I’d care to admit until I trained myself not to make that mistake. The battery life in portable mode isn’t great, you can expect roughly 3 hours of Zelda gameplay (give or take a half hour) while off the dock (battery life will vary depending on how taxing the game you’re playing is on the system). That’s not particularly good for a portable gaming device, even one that delivers as much power as the Switch. The internal 4310mAh battery isn’t terribly large for modern mobile devices (the battery in the new LG G6 is 3300mAh, and Apple’s iPad Mini 4 has a 5,124mAh battery). 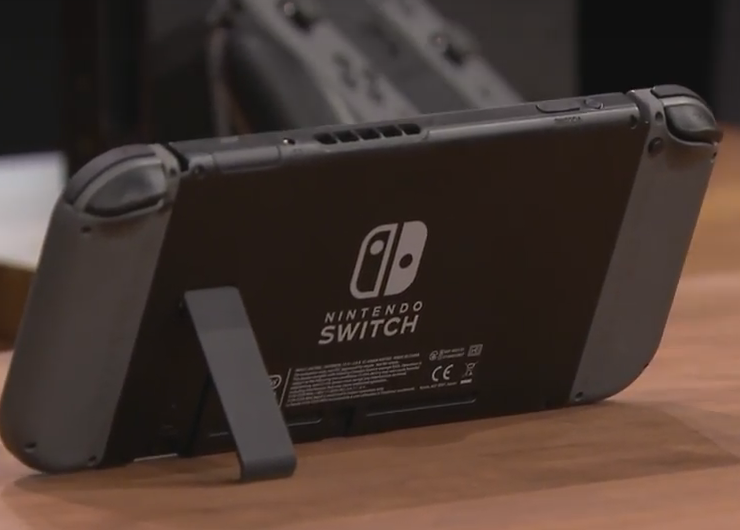 And because the charging port is on the bottom, you won’t be standing up the tablet in tabletop mode if you’re in need of power during an extended gameplay session off the dock. But you’ll also have to keep the joycons charged up as well. That can be problematic if you’re a couple of hours into a docked, TV gaming session, as the included joycon grip doesn’t have a charging port on it. For that you’ll have to drop $30 for an additional joycon grip that does include the charging port (or get a pro controller). It’s an odd oversight that will force players, at times, to play in portable mode instead of docked mode, simply because their controllers need charging. The 6 inch 720p screen looks pretty good. Yes, we’re used to mobile devices coming with vibrant 4K, Super Amoled screens with super saturated colors, but the Switch’s more modest screen was likely a calculated decision meant to aid in the longevity of its modest sized battery. After all, pushing fewer pixels means less strain on battery. And of course, the Switch isn’t exactly a powerhouse as far as the internals go. I haven’t used it out in bright daylight, but the screen looks nice enough indoors that most owners won’t complain. Can we really see the difference between 720p and 1080p on a screen of this size? I’m inclined to say no, but either way I’m willing to say the 720p screen here is good enough. Speaking of the screen, be careful when inserting the Switch into the dock. You may want to invest in a screen protector, because some owners have complained about seeing scratches on the screen due to repeatedly placing the device on and off the dock. The design of the dock doesn’t make placing the device in it particularly easy. You can easily miss the docking port, and rub the screen against the inside of the front wall of the dock. It would have been nice if Nintendo had designed it in such a way that it was as easy to slide in as the joycons are to place on the sides of the tablet. 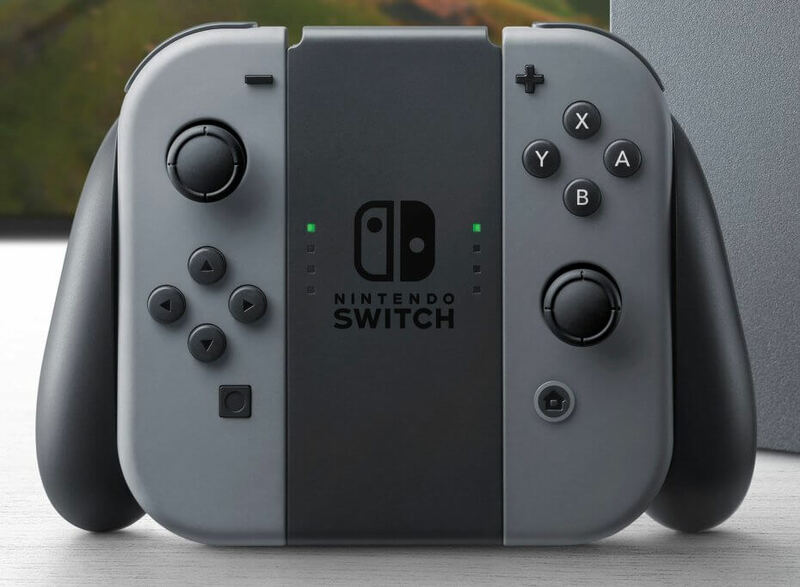 There is no reassuring click with the dock the way there is with the joycons. Or they could have at least provided a screen protector. I’ve already mentioned the oversight of packaging a joycon grip without a charging port on it. The kickstand is a flimsy little piece that is likely to be the first thing everyone breaks. It’s a poorly designed, thin stand that juts out of the back, right side of the device, which means you’ll have to be careful about how you stand it up. There’s nothing on the left side to help hold it up if you place it on something that isn’t a perfectly flat surface. And it isn’t adjustable at all. Microsoft’s surface tablets have a kickstand that extends the entire length of the device, and can prop the device up at various angles so you can easily use it no matter what angle you’re sitting at. 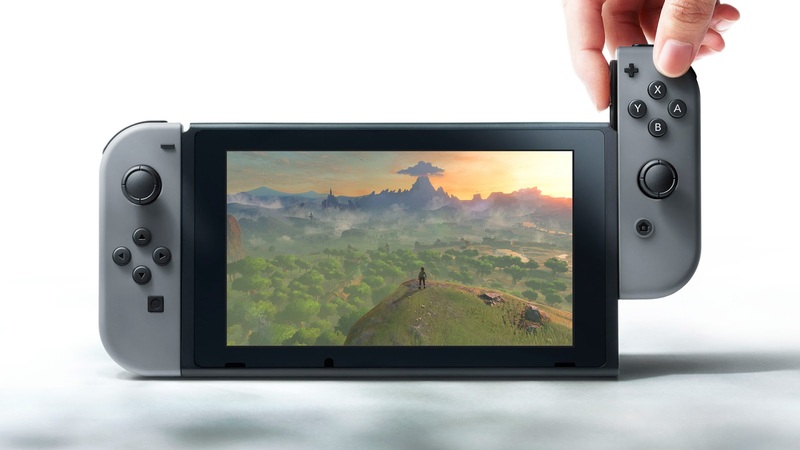 With the Switch, you get one angle, and it’s not a particularly good one. If you go for tabletop mode, you’ll be forced to slouch or lower your chair in order to see the screen from a comfortable angle. This is something that’ll need addressing whenever gen 2 comes along (too soon?). There’s also no headphone jack on either the pro controller or the joycon grip (the way there is on the PS4’s Dualshock 4), so if you want to play with headphones so you don’t disturb your family or a roommate, you’ll have to play in portable mode. The questions Nintendo still has to answer with the Switch revolve around support from developers (will there be a steady release schedule of games?) and online play. Again, with the only headphone jack being on the top of the tablet itself, you won’t be able to chat with friends during docked online play (unless they add support for standard USB headsets that plug into the base of the dock). The future of online gameplay is still very much up in the air with the Switch. It’s also baffling - considering the system is better positioned to go up against mobile gaming devices like the Nvidia Shield, and the iPad - that it doesn’t feature a fully realized operating system. The home screen is fairly well designed in its simplicity, but it doesn’t feature a browser or support for video or music streaming services. Where are the YouTube, Netflix, and Spotify apps? As a pure gaming device its flexibility offers more than most of its competitors, but if it truly wants to succeed against other devices in the mobile space (and as a home console for that matter), it needs to be able to do more than simply play games. Both mobile devices and home consoles have apps for video and music streaming services. The Switch needs to be the all in one entertainment device its competitors already are in order to warrant the price of admission. Some of this may sound harsh, but I actually do like the Switch quite a bit. The fact that it can bring first party Nintendo games both to the TV and to mobile is a game changer that’ll be worth it for most gamers. But there’s still plenty to prove.